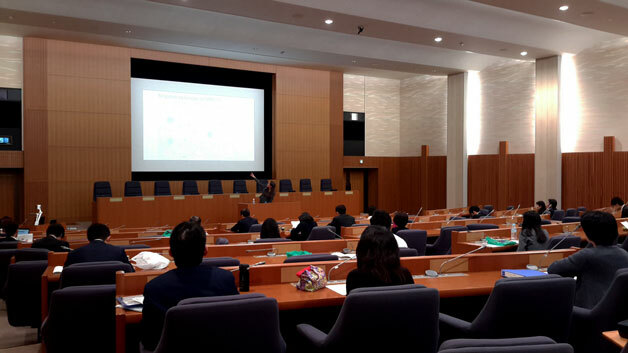 On 12 January 2018, UNU-IAS postdoctoral researcher Lisanne Groen delivered a lunchtime briefing at the Japanese Ministry of Foreign Affairs (MOFA) headquarters in Kasumigaseki, Tokyo, on the United Nations Framework Convention on Climate Change (UNFCCC) and its 2015 Paris Agreement. The aim of the briefing was to familiarise MOFA officials from all departments with the UNFCCC and the Paris Agreement. The briefing also touched upon the US announcement to withdraw from the Paris Agreement and highlighted UNU-IAS work on climate change, including the Low Carbon Technology Transfer (LCT) project. Groen’s presentation was followed by an intervention by the MOFA Director of the Climate Change Division of the International Cooperation Bureau, Tomoaki Ishigaki. Afterwards, the floor was opened for questions from the audience, which resulted in a lively discussion about the role of key players in the UN climate change negotiations, including China, Africa, the private sector, indigenous peoples, and local communities. Groen’s presentation was part of a regular series of UNU-MOFA briefing sessions.